Your life is a story …. scrapbook it! CM’s personal trimmer to crop the photos. This is another sketch from the online class I’m taking. Thank you for looking! Today’s layout is also from the online sketch class I’m taking. 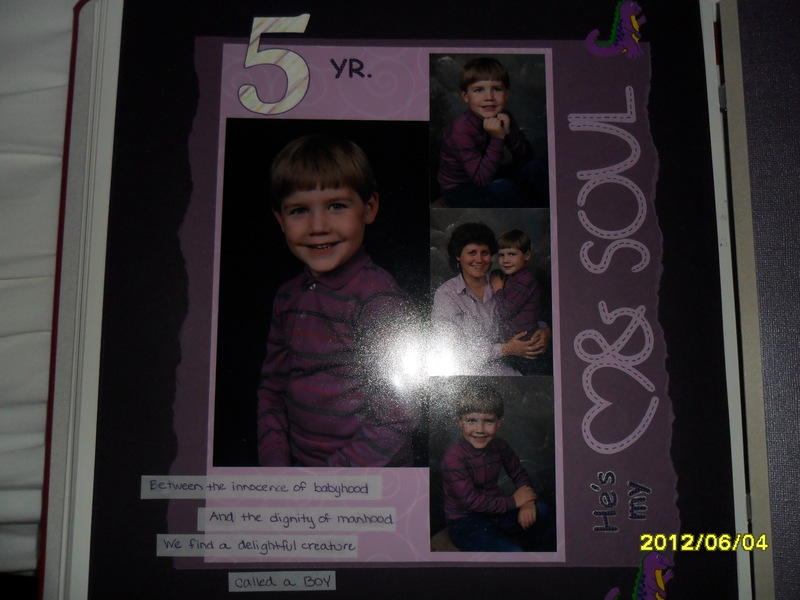 This page is for one of my Mom’s scrapbooks. 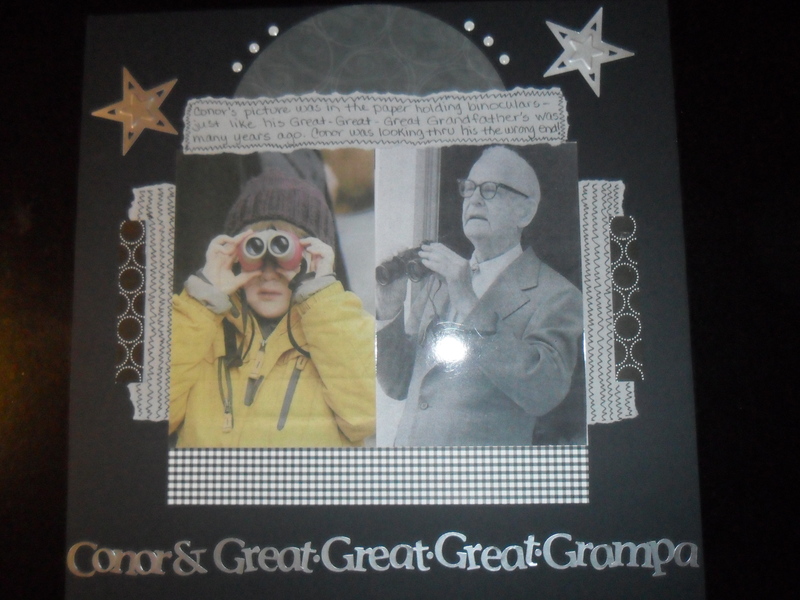 I know she will like it because it highlights her beloved Grandfather and her adorable great-grandson Conor. I used scraps of paper from my black paper folder for this, and silver ABC’s, and added some silver embossed punched stars. I also used CM’s custom cutting system – the largest circle – and cut it in half for the top semi-circle. Thank you for looking today. Today’s layout is from another sketch from the online sketch class I am taking. I used CM’s Cheerful Christmas paper and stickers. I did some tearing and really like the look. I also used CM’s Rotary Trimmer with the pinking edge for the strips. Thank you for checking in today! Welcome to 2013! I hope to post more often to my blog this year. We shall see…. For today’s post, the border on the left was made using CM’s beautiful Divine paper. I cut 2 straight strips of different widths, and then used the circle punch to punch 9 circles and taped them behind the strips. The border on the right was made using CM’s beautiful Reflections paper. This is my favorite palette right now. Once again, I cut 2 straight strips of different widths. The I cut a strip using the tearing tool. Those pretty flowers and gems are also part of the Reflections palette. Thank you for looking! I became a Mom 29 years ago today, at 9:00 PM precisely, to my son Christopher. It was all I ever wanted – to be a Mom. It’s so hard to believe that it was 29 years ago; although in some ways, it does seem like forever ago. June 6 will always be a happy, happy day to me – the best day of my life. This was a super easy layout — royal blue, and red cardstock. I punched out a few stars on the royal blue CS; and used the tearing tool for the red. 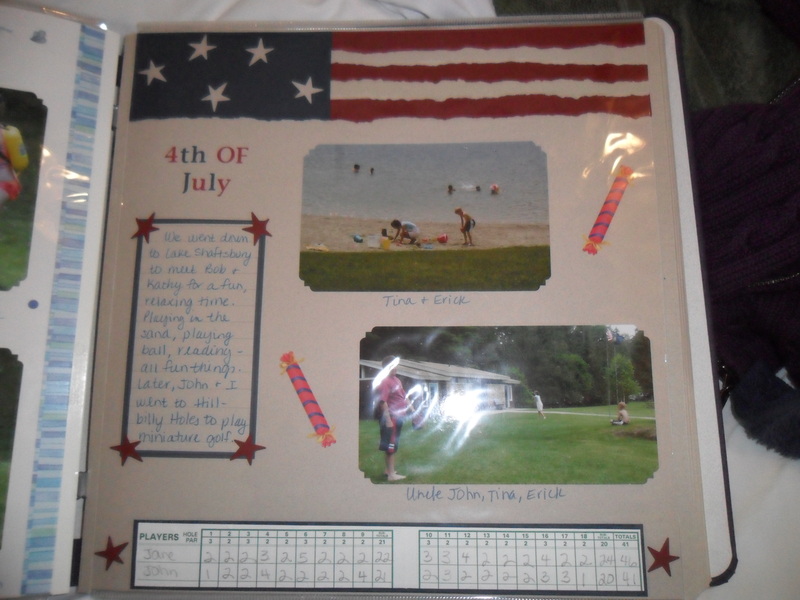 I used a journaling box, mini ABC’s, and mini-golf memorabilia to go along with our July 4 pictures. I did things a little different in this layout. I layered bazzill cardstock, red and green, any-which-way, and although not a favorite of mine, I was happy enough with the result. I also used the tearing tool and drew some squiggles with my silver pen. I used vellum to describe the scenes. 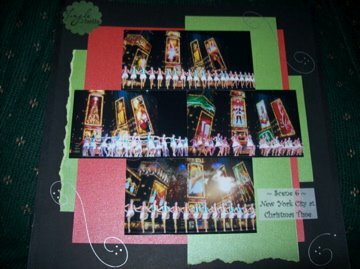 This is one of those layouts where the pictures definitely outshine the layout, and that is perfectly AOK with me. 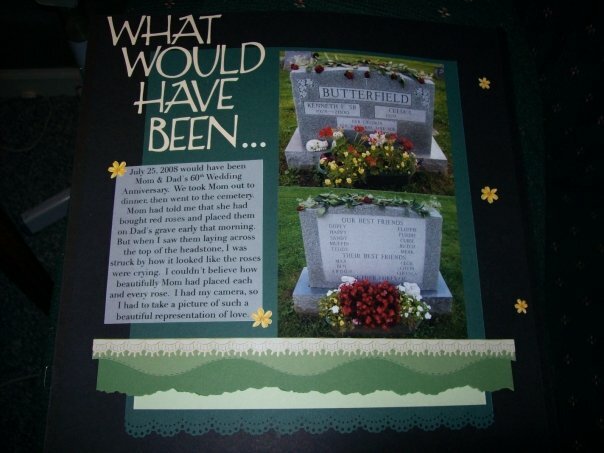 When I went to the cemetary with my Mom and saw the roses that she had laid there that morning, I knew I had to scrapbook and tell this story. 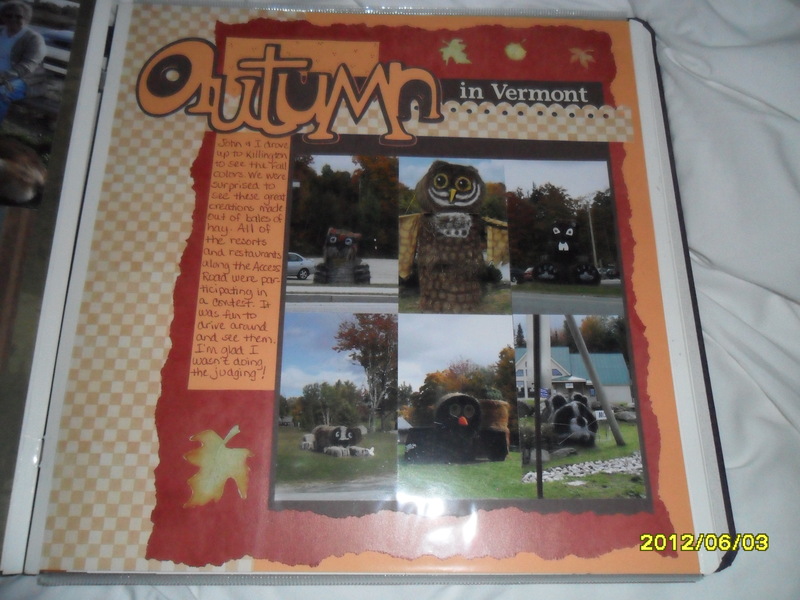 It’s hard to scrapbook tough subjects, but I also believe it’s therapeutic. Another one of my favorite layouts. 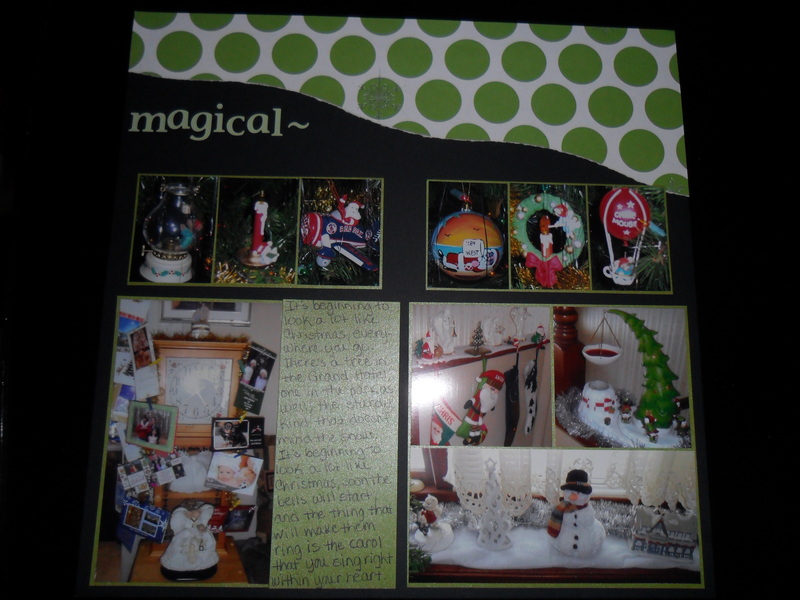 This is a layout that I did while taking an on-line scrapbook class. I don’t usually do layering of paper – it adds weight to my book. But I was really happy with how this came out. 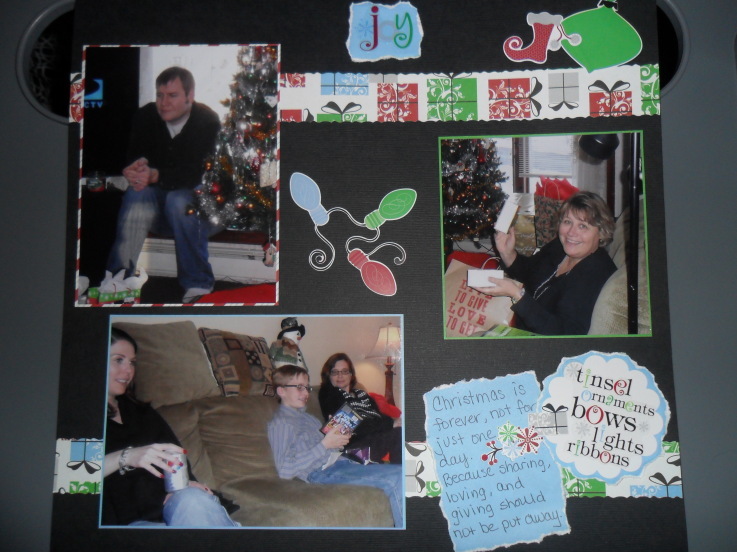 What do Scrapbooking, Makeup, Nail Wraps, and Retirement have to do with each other? A wonderfully creative weekend that brings together crafty friends. Come for a day or all 5! This is my personal blog. I am an Independent Creative Memories Consultant and responsible for its content. Creative Memories does not endorse the use of, or the contents of, the classes, services, or non-Creative Memories products I may mention or offer here.